Old Town Nice is a culinary paradise. There are delicious special dishes like for example the genuine Salade Niçoise, made with different kinds of raw vegetables, black olives, fish and hard-boiled egg. Another specialty is socca, a large thin pancake which is baked in a wood-burning oven. Socca taste great with a glass of the local wine from the Bellet vineyards on the hillsides of Nice. At the Côte d'Azur many days have nice weather and on these days the tables and chairs are placed outside in the narrow streets and the snug little squares. 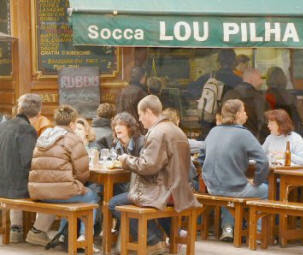 Even in the winter the café terraces are often filled with people. There are many nice boutiques in Old Town Nice. 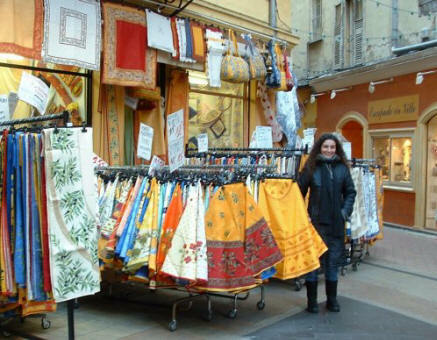 You have a great choice of nice souvenirs, jewelry, amazing art, beautiful Provençal fabrics and very fine delicacies. Some of the shops in Old Town are very old and have hardly changed since they were founded. In Rue Pairolière in the shop of Borgeaud one can buy health food and vitamins since 1922 for example. 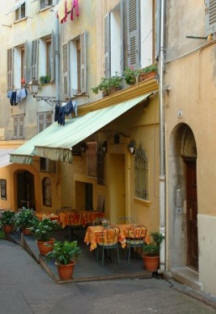 Another old shop is Bestagno, selling umbrellas and parasols since 1850.